If you have never had pan fried goat cheese, it’s time for you to start. Trust me. 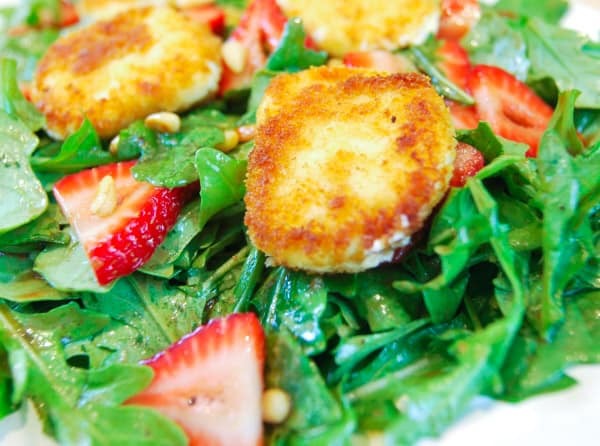 Jump to the Fried Goat Cheese, Strawberry and Arugula Salad Recipe or read on to see our tips for making it. 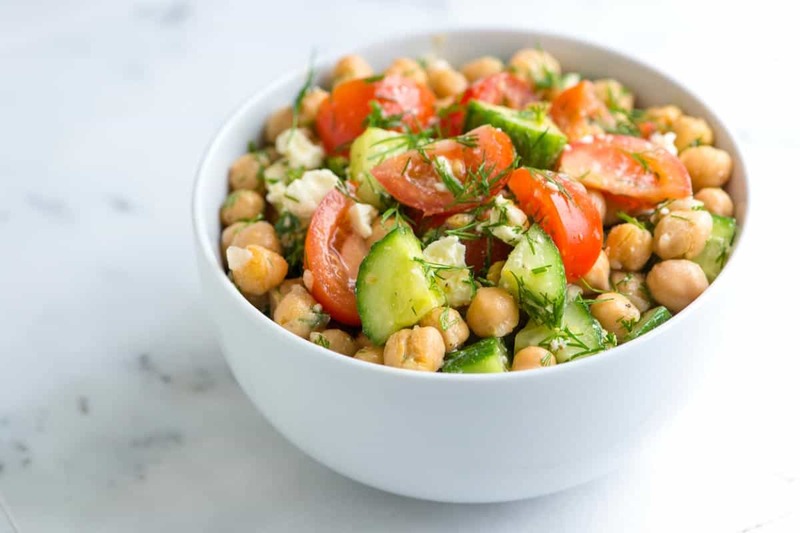 YOU MAY ALSO LIKE: Easy chickpea salad recipe with lemon, fresh dill, crisp cucumber and tomatoes that’s quick to make and can be made in advance. Jump to the Chickpea Salad Recipe. I love this salad. The base is made from peppery arugula — although any baby green will work. Then we add sliced strawberries, pine nuts and little rounds of goat cheese that have been dipped in breadcrumbs and lightly fried until crisp. 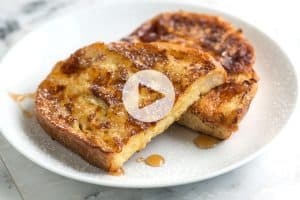 The cheese inside is creamy and warm, while the outer breading is light and crispy. For the dressing, we love throwing our favorite strawberry balsamic dressing together. We make a simple balsamic vinaigrette — made with balsamic vinegar, olive oil and mustard — then we whisk in some strawberry jam. It’s perfectly tart and sweet and works wonderfully with the goat cheese and strawberries. YOU MAY ALSO LIKE: How to make goat cheese stuffed baked chicken meatballs in the oven. 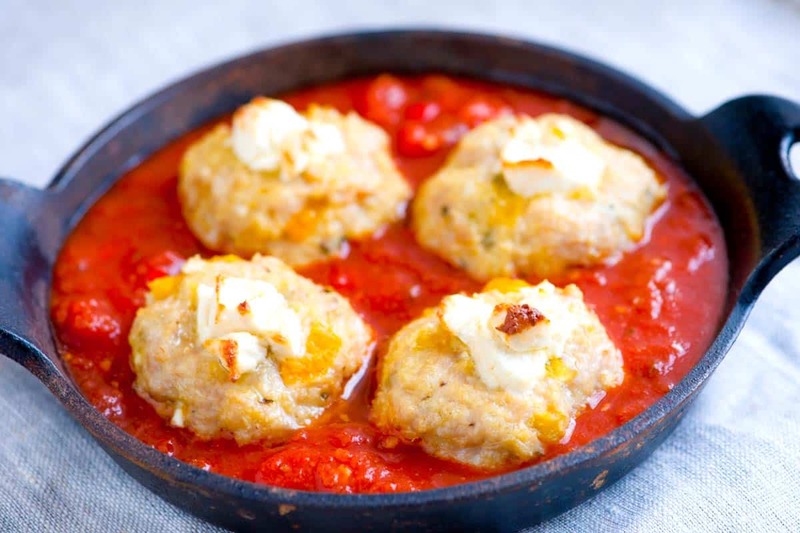 Jump to the Goat Cheese Stuffed Baked Chicken Meatballs Recipe. 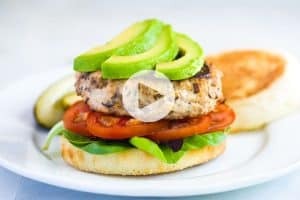 For more arugula recipes, take a look at our Lemony Arugula Salad with Couscous, Cucumbers and Feta, this lovely Shaved Fennel and Arugula Salad Recipe and these Baked Chicken Thighs with Potatoes, Garlic and Arugula. When choosing the goat cheese, consider buying an herbed option. Slicing the cheese can get a little messy, if it crumbles on you, just press the rounds back into the correct shape before adding to the egg whites and breadcrumbs. Slice the goat cheese into 8 slices. In a small bowl, whisk the egg whites and water. Dip each goat cheese slice into the beaten egg whites, then into the bread crumbs, patting down so the cheese is well coated. 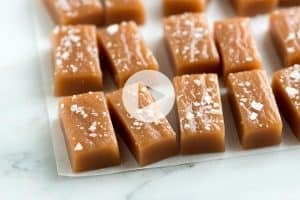 Place the slices onto a plate and refrigerate for 15 minutes. Meanwhile, toss arugula, sliced strawberries and the nuts in a large salad bowl. Prepare the dressing. Heat olive oil in a skillet over medium heat. Fry the goat cheese rounds on both sides until browned on the outside but not melted inside, 2 to 3 minutes. Add a few tablespoons of strawberry balsamic dressing to the salad bowl and lightly toss. Divide salad between serving plates then place 2 fried goat cheese slices on top. Finish with a light sprinkle of salt and a few grinds of black pepper. I really love goat cheese it is really delicious. Most of the time I eat it as a dessert or use it to make a salsa.